The Deputy General Markel Olano and the First Deputy General and head of Culture and Tourism Denis Itxaso, have presented in the framework of the Tourism Fair Sevatur, the new tourism brand of Gipuzkoa. In recent years tourism has grown considerably in Gipuzkoa and is expected to continue to do so in the coming days. 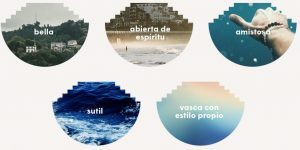 The San Sebastián Brand is recognized worldwide as a destination that offers many alternatives to the visitor and is associated with a quality tourism with cultural, scenic and gastronomic value. However, Gipuzkoa remains a stranger in the world of international tourism, although it hides multiple secrets. For this reason, the Department of Culture and Tourism has decided to reinvent its tourist brand and take advantage of the notoriety of the capital as a claim to distribute the visits throughout the territory. Thus the new brand to be used will be the “Explore San Sebastián Region”. “Gipuzkoa Is evoked without naming it, using San Sebastián as a claim, and through an elegant brand image, sophisticated and evocative of a region laden with attractions,” said Itxaso. As for the logo, this reflects a very rich tourist offer. Not only beach or mountain, but also gastronomy, culture, human landscape, history and active tourism. It Is a polyhedral offer, with many faces for a polyhedral audience that comes from all over the world, with different motivations and objectives but with the common goal of wanting to live singular experiences. “It Is a very dynamic logo, very changeable, and that transmits that feeling of multiple experiences for multiple visitors,” said Itxaso.